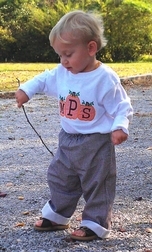 This is our boy's shirt that coordinates with our 3 Harvest Pumpkins Dress or Outfit for girls. Perfect for sisters and brothers. The shirt is made of pre-shrunk 100% white cotton and is soft and comfortable. 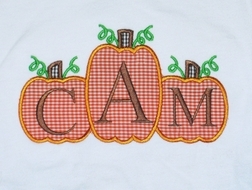 You may choose long sleeves or short sleeves and the orange gingham pumpkins look wonderful monogrammed in brown to match the brown gingham pumpkin stems and brown gingham pants.